Welcome back to Press Start to BGN, Laurier’s gaming show by a bunch of Game Design & Development students here at Laurier’s Brantford campus. The program is very new and so is our show, so for those who don’t know Game Design & Development is headed by Dr Scott Nicholson through the Brantford Games Network or BGN, hence the name “Press Start to BGN” which sounds like “begin.” This week on the show we invite our new host Eden to the group! Make sure to give her a warm welcome! Thanks for tuning in! Mass Effect: Andromeda’s price has dropped incredibly fast and has tanked very hard in terms of success. Manveer Heir who has recently left Bioware also commented on the fact that the valid criticisms of the game fetishizing colonialism. Pokemon Go Halloween Event is on Until Nov 2nd you’ll be able to collect Cubone, Misdreavious etc. Here are your games for this week! Friday is looking little grim for my wallet. not gunna lie…. Okay so like, this game has been out for over a month, but it’s finally here for PC! Considered even better than the original Destiny, this game has a story you can actually follow in-game! (Although my roommate bashes it for being “written by a 5 year old”.) If you wanna play, I’ll be playing on PC, so join me! Assassins Creed is the newest game in the Assassin’s Creed series, and it continues to look better and better. After the previous couple of games that Ubisoft put out in this series, Origins takes more of an RPG-style shot at the game, putting a little more into character levels, but still very much focusing on the experience of being an assassin. Since it takes place in ancient Egypt, you get to pet cats and worship them as gods! Also stuff about Templars and the Brotherhood of Assassins and the pyramids. Also, YOU CAN PET CATS. The sequel to the hit game Wolfenstein hits shelves Friday, and with it follows a whole lot of criticism! I’m gunna be honest with you though, if you can argue the phrase “Being a Nazi is bad”, then you probably shouldn’t be listening to this show. The Wolfenstein 2 Twitter ads have been blowing up with their anti-nazi and anti-trump standpoints, and it just makes me excited to play this game. The game is about killing Nazis, so pick up the game on Friday, and punch a Nazi! The hat has eyes and you can become a dinosaur. The newest Mario game is here, and it looks like a spiritual successor to Super Mario Sunshine? Super Mario Odyssey has you running around a 3D world full of strange (and some familiar) monsters and…wait, is that a human? In MY MARIO GAME? Anyways, it looks fun, and very much a Super Mario Experience! Hey guys, Jelena here! I used to write the news, but now I’m responsible for the Topic of The Show. This week we got to know our new host, Eden, a bit better. She’s a first year Game Design student, and we’re super excited to have her with us. Her favourite game currently is Horizon Zero Dawn and the worst game she’s played is Paris’ pre-alpha narrative Twine game, The King of Thought. The first game she ever played was Prisoner of Azkaban for the PC, and her favourite game to play with other people is Overwatch on PC, although she did add in that she prefers single-player games, and is currently struggling to get Symmetra Dragon skin (but managed to pull, much to Paris’ dismay, a Mercy witch skin). Eden is enjoying first year so far, but is intimidated by all of the older kids, since she is only 17. Don’t worry, we assured her that most of us upper year kids don’t bite. From Blizzard Entertainment comes their 2016 first person shooter, multiplayer game Overwatch. PlayStation 4, and Xbox One. and PlayStation’s 3 and 4. From Nintendo comes another installment to their Pokémon franchise, 2016’s Pokémon Sun and Moon. 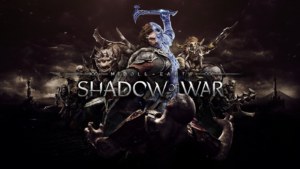 From Monolith Productions comes the sequel to Middle-earth: Shadow of Mordor, the new Middle-earth: Shadow of War. In this action role-playing game, the story takes place right after the first installment, having players be Tailon, a human ranger, on his path of forging a new ring of power to take down Sauron for good. Amass your armies and get ready for war, available on PC, PlayStation 4 and Xbox One.